Instance leveling is the best way to power level your World of Warcraft character, and the new dungeon finder system makes it very easy. All you have to do is queue up for a random instance, and the dungeon finder will do all the work of locating a group for you. 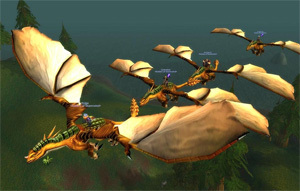 What makes the dungeon finder even better is that it pulls players from all the servers in your server group, which limits the amount of time spent waiting for a group. Of course one of the things players are usually wondering about is which ones are the best instances by level. It’s just as easy to queue for specific instances, and sometimes you might have to choose a specific one instead of a random one in order to get the one you want. Here’s a quick rundown of the best instances by level for the Burning Crusade part of the game. Levels 58-61: Hellfire Ramparts – You can queue for Hellfire Ramparts as early as level 58, and the amount of experience you’ll get from being in a Burning Crusade dungeon at level 58 is well worth it. However, you will have to complete several pre-requisite quests before you can queue for Hellfire Ramparts. Check your instance leveling guide to find out about those pre-requisites. Levels 61-63: Blood Furnace – When you reach level 61, you may land in the Blood Furnace as part of random instance leveling, but you will have to complete the pre-requisite quests in order to be eligible for the quests that can be done inside Blood Furnace. Levels 64-66: Mana-Tombs – Characters that use mana will be slightly annoyed with the Mana-Tombs because there just never seems to be enough mana available. However, the gear bonuses make this one worthwhile. Levels 66-68: Auchenai Crypts, Sethekk Halls, The Steamvault: Auchenai Crypts and Sethekk Halls continue the storyline of Auchindoun, right after Mana-Tombs, and the Steamvault will take you back to the Coilfang Reservoir. Any combination of these three quests will do. Levels 68-70: As soon as you reach level 68, it’s time to head to Northrend. Technically, the Burning Crusade doesn’t end until level 70, but you can enter Northrend at level 68. The reason you will want to finish up your last two Burning Crusade levels by instance leveling in Northrend is because of how fast you will earn those last two levels. Instance leveling in Northrend for levels 68-70 is much faster than finishing up in the Burning Crusade instances, mainly because the monsters you’re killing are several levels higher than you are. However, being in a group with four other people will certainly make it doable, even for squishy classes like mages and priests.